Saxony-Anhalt (German: Sachsen-Anhalt, [ˌzaksn̩ ˈʔanhalt]) is a landlocked federal state of Germany surrounded by the federal states of Lower Saxony, Brandenburg, Saxony and Thuringia. Its capital is Magdeburg and its largest city is Halle (Saale). 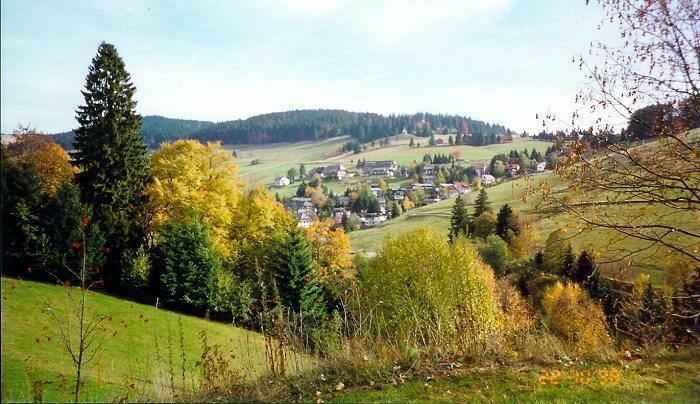 Saxony-Anhalt covers an area of 20,447.7 square kilometres (7,894.9 sq mi) and has a population of 2.34 million. It is the 8th largest state in Germany by area and the 10th largest by population. The state of Saxony-Anhalt grew out of the former Prussian Province of Saxony and Free State of Anhalt during Prussia's dissolution after World War II. In 1945 the US army administration and, subsequently, the Soviet army administration organised the former province's territory into the new state. The state became a part of the newly established German Democratic Republic in 1947 but in 1952 the state was dissolved and its territory was divided into the East German districts of Halle and Magdeburg, with the exception of the city of Torgau which joined Leipzig. After German reunification in 1990, the state was re-established, leaving out Torgau. Saxony-Anhalt should not be confused with Saxony or Lower Saxony, the names of two other German states. 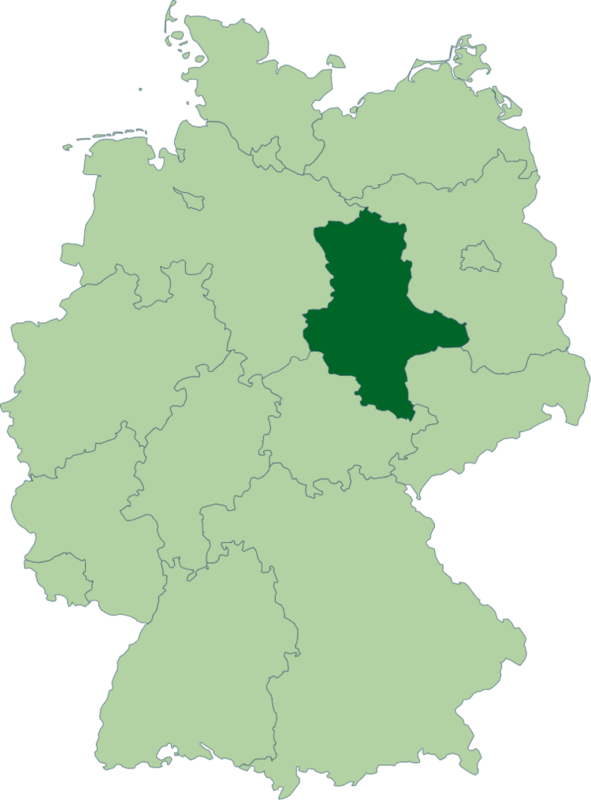 Saxony-Anhalt is one of 16 Bundesländer (see German: Bundesland) of Germany. It is located in the western part of eastern Germany. By size, it is the 8th largest state in Germany and by population it is the 10th largest. It borders four other Bundesländer: Lower Saxony to the north-west, Brandenburg to the north-east, Saxony to the south-east, and Thuringia to the south-west. 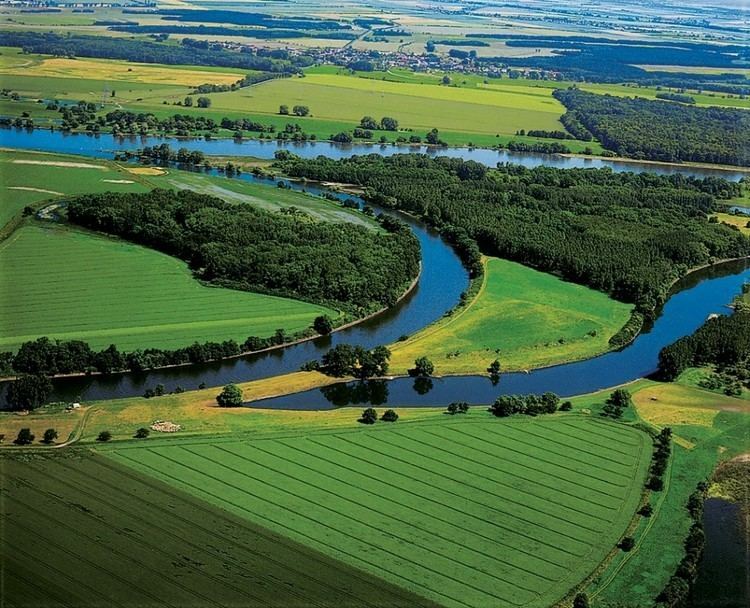 In the north, the Saxony-Anhalt landscape is dominated by the flat expanse of the (North German Plain). The old Hanseatic towns Salzwedel, Gardelegen, Stendal, and Tangermünde are located in the sparsely populated Altmark. The Colbitz-Letzlingen Heath and the Drömling near Wolfsburg mark the transition between the Altmark region and the Elbe-Börde-Heath region with its fertile, sparsely wooded Magdeburg Börde. Notable towns in the Magdeburg Börde are Haldensleben, Oschersleben (Bode), Wanzleben, Schönebeck (Elbe), Aschersleben and the capital Magdeburg, from which the Börde derives its name. The wine-growing area Saale-Unstrut and the towns of Zeitz, Naumburg (Saale), Weißenfels, and Freyburg (Unstrut) are located on the rivers Saale and Unstrut in the south of the state. The capital of Saxony-Anhalt is Magdeburg. It is the second-largest city in the state, closely after Halle. From 1994 to 2003, the state was divided into three regions (Regierungsbezirke), Dessau, Halle and Magdeburg, and, below the regional level, 21 districts (Landkreise). Since 2004, however, this system has been replaced by 11 rural districts and three urban districts. For the earlier history see the respective articles of these entities before 1945. 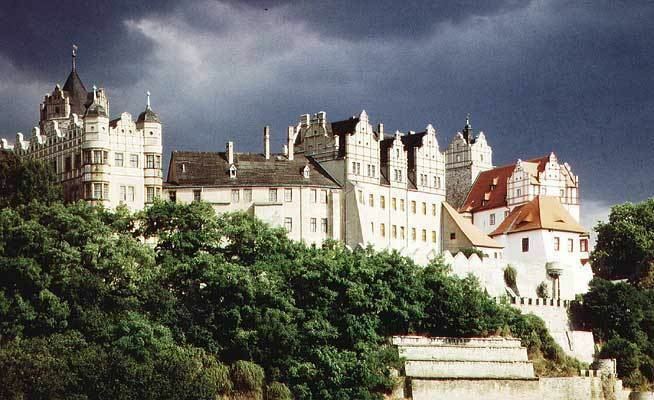 Anhalt takes its name from Anhalt Castle near Harzgerode; the origin of the name of the castle remains unknown. The percentage of foreigners in the population of Saxony-Anhalt is 1.9 percent, the lowest of all the federal states of Germany. In 2010, the majority of citizens in Saxony-Anhalt were irreligious and more were leaving the churches than entering them - in fact, Saxony-Anhalt is the most irreligious state in Germany. 17.6% of Saxon-Anhaltish adhered to the major denominations of Christianity (14.1% were members of the Evangelical Church in Germany and 3.5% were Catholics), 2% were members of other religions (mostly Judaism, the New Apostolic Church, Islam and Mandeism). 80.4% of the citizens of Saxony-Anhalt were religiously unaffiliated. Minister-president Reiner Haseloff (CDU) retained his position in a coalition with former partner SPD, and the Greens. Even though part of this recovery was induced by the quite good performance of the Germany economy, Saxony-Anhalt did not only follow the national trend, but clearly outperformed other German states. For example, it got ahead of three German states in terms of unemployment (10.8%, as of September 2011): the German capital and city-state of Berlin (12.7%), the city-state Free Hanseatic City of Bremen (11.3%), and Mecklenburg-Western Pomerania (11%). Saxony-Anhalt is also famous for its good soil. Hence, the food industry has an important role with almost 19,500 employees across 190 plants in 2010. 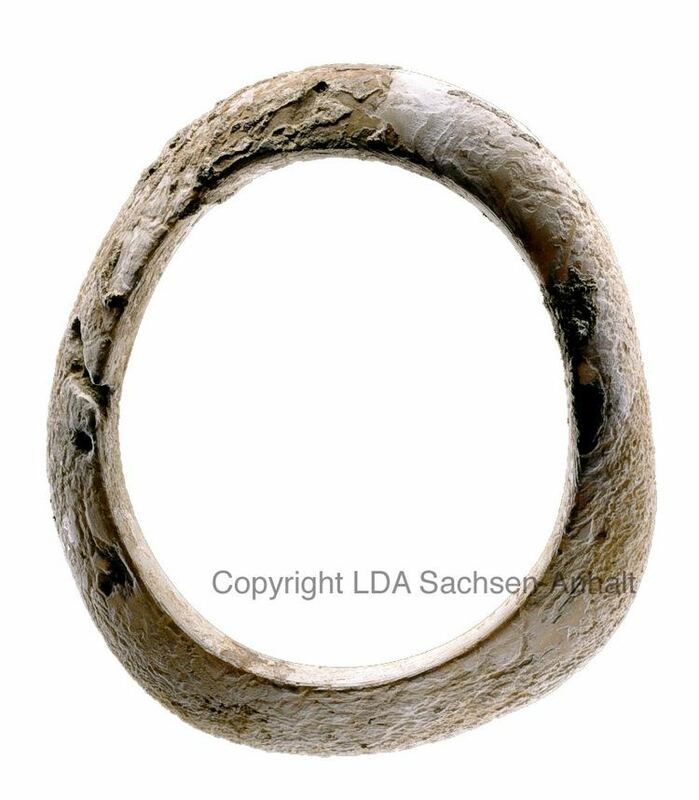 Some of the best known products are Baumkuchen from Salzwedel and Halloren chocolate globes from Germany’s oldest chocolate factory in Halle.